The result of the higher positions on the search engine results pages (SERPs) will be an increase in organic performance and potentially increased conversions. But what if you have links but they aren’t working (404 errors) or have expired? Well that’s where incorporating link reclamation into your strategy is a must. Link reclamation is the process of identifying existing citations of your brand or website across the web and taking action to gain a backlink from this existing content. This tactic generally provides a more immediate return because the hard work is often done in terms of getting content about your brand on the web. We can increase the value of this content by introducing or fixing a backlink, and ensuring that the backlink will pass Authority, Trust and Relevance to your website as per the latest Google guidelines. This is a process where we use several tools to identify existing links across the web that are now broken and no longer direct a user to your website correctly. Once, identified we can either contact the webmaster to fix the link on their webpage, or create a redirect so the user (and link authority) is passed to the correct page on your site. It’s worth noting here that whilst adding in 301 redirects will restore some SEO value to the affected links, a link reclamation project is the only way to retain the full link value. This is a process where we use several tools to identify content where your brand name, website, previous campaigns and more have been included in the content of a webpage but no link is included. This is also known as a citation. Once, identified we can contact the webmaster and request that the mention of your brand is referenced with a backlink supplied back to your website. Firstly, we will utilise several tools to identify broken links and un-linked brand mentions. We will then review each of these to gauge the potential Authority, Relevancy and Trust that any link can pass. Any broken links that can be fixed with a redirect are highlighted as a ‘quick win’ opportunity for the Content Marketing team as part of their on-going outreach activities. Our Content Marketing team will also continue to monitor for broken links and unlinked mentions of brands or campaigns. Anything that is highlighted in this phase will then be judged to show the potential value of turning mentions and broken links into working backlinks a domain. If there is value we then contact webmasters in an attempt to gain these links. Ahrefs – This platform offers some of the best tools out there, in terms of helping SEOs identify broken or missing links. Using the ‘Site Explorer’ function in Ahrefs you are able to enter you domain name and then look at all lost (identified in red) backinks. 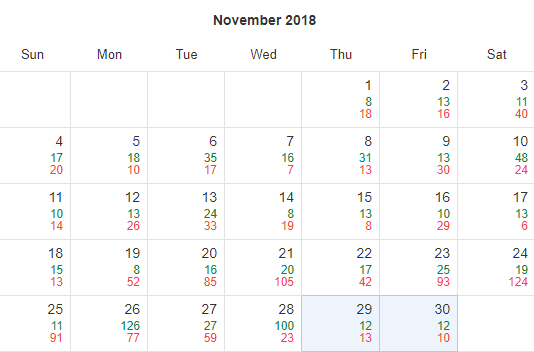 In fact you can see all of the new (green) backlinks in the calendar view as the image below displays. You are also able to identify all of the anchor text and the backlinks – and the error that is occurring. This list is a starting point for businesses to repair. linkTRAX® – We created linkTRAX® our industry-leading outreach management platform to fill a gap in the market and to act as a way of monitoring all of the links that our clients generate. It was designed to provide data-driven analysis and visibility into their campaigns. linkTRAX® is our custom-made platform, used to monitor, analyse and track our clients’ outreach activity. A fundamental component of our platform’s functionality is to actively monitor links after placement, providing real-time data surrounding the quality and longevity of our campaign activity; ensuring links do not break or disappear. By tracking previous placements, we can also ensure that each blog placement is unique for each of our clients, maximising the SEO benefit of our outreach activity. We have worked with HomeLet for some time on their SEO strategy in a bid to see their performance improve. One part of their strategy was to make sure they were getting what they deserved from their links. One of the highest performing pieces of content for HomeLet is their ‘Rental Index’ which looks at the rental landscape and the market as a whole. This piece of content was distributed through a PR company who reported back to use a list of where they had sent the ‘Rental Index’. This is a monthly task and once the list comes over to us our team start to go through and get links ‘followed’. We report these to HomeLet and in linkTRAX®. Any links identified here were cross referenced with linkTRAX® and added value to the wider SEO performance of the brands by boosting its backlink profile.